And they really don’t. In the eyes of the consumers, you’re just ANOTHER product / brand. Yes, you may be the best among all but think about it – your competitors are shouting the very same message and this will result in a long, and perhaps an unfavorable journey for your business, simply because it will take time for the consumers to consider your message, evaluate and compare them with your competitors. 1. Consumers today are better decision makers – they tend to research and ask around for opinions before purchasing. 2. Consumers today had it enough with marketing campaigns – they simply avoid you (see short video here). Neither outcome favors you as an marketer, especially when your business is new – budget constrains and lacking in credibility. Today’s consumers had it tough. Not only they have to put up with marketing spams, they have their own problems to attend to as well and all they want is a solution to their problems. If your marketing campaign only talks about your product, give it up – consumers won’t buy-in. 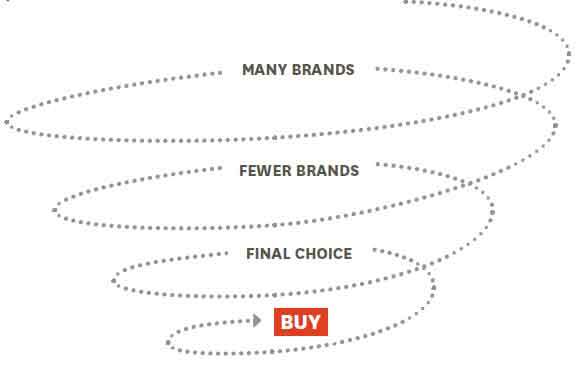 The lines in grey illustrates the processes involved in the conventional consumer purchasing funnel and the one in red shows how powerful a bond / relationship with the consumer can be. It builds confidence among the consumers allowing them to jump into purchase – more powerful than conventional marketing efforts. I’m no way suggesting that this method is a shortcut to success. It takes time to build a bond with the consumers but its effect may be greater than conventional marketing efforts and social media makes it possible. Social media platforms such as Facebook and Twitter are great tools to approach the consumers because they are already on it. Approach them like how you would to approach a friend without being pitchy. 1. You’re there to offer a solution to their pain. 2. You’re there to build relationships. 3. You’re there to give value. 4. You’re there to ultimately convert them into advocates. 5. You’re there to listen. It’s time to do away with conventional marketing and let the ‘human’ do the job. Let people drive your business, not products. What are your thoughts on conventional marketing vs social media marketing? Does the buying power solely rests on the consumers themselves now? diagrams adapted from: Harvard Business Review. it’s definitely more about social media marketing, but it will soon become social CRM as customers will expect you to use this means of communication via social channels so business will be forced to move in this direction, otherwise it will affect their business. That’s a great observation you have there. Soon consumers will demand / expect social media and that’s when businesses that are already on it has the advantage. In fact it is already slowly happening now. I know friends (and myself) that would rather tweet a complain rather than sending an email to feedback@yourbusiness.com (and we won’t even know if they’ve received it). Exciting times, exciting times ahead!